I don’t intend to produce a full post on this just yet, but rest assured that a nasty smell is already pouring off this story and this Freedom of information request should give some broad hints as to the direction of travel but, essentially, it looks increasingly looks like Swindon Borough Council wants to have the Dial a Ride service supplied by a company it owns , and not the independantly run Swindon Dial A Ride Charity. For now though, I’ll just publish the FOI request made via www.whatdotheyknow.com while I carry on digging elsewhere…..
remove the annual grant given to that charity. Councillor Perkins is actually illegal under European law? 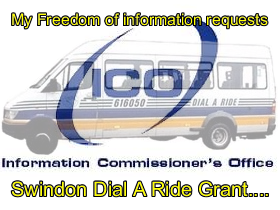 legality/illegality of the grant given to Swindon Dial a ride. 2.2 When was such advice requested or given? given to the Swindon Dial A Ride Service? received and when was it given? 4.3 What was the advice? 4.4 Was the advice given in writing or orally? or instructed that such external external legal advice be sought? organisation(s) from which legal advice was sought? 5.3 What advice was given by each? Swindon Dial A Ride Service. given to the Swindon Dial A Ride Service.